Prices includes HST, lock and helmet. 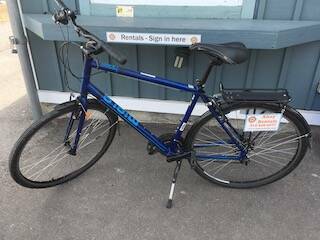 We have 11 hybrid bikes, sizes from 15" to 22". Explore the waterfront path in Kingston or take the free ferry ride over to Wolfe Island and explore a secluded sandy beach. We will give you maps for both these locations. Baskets, locks and helmets are all included in all rentals. Hourly Rentals Minimum one hour rental, the second hour is rounded to the nearest 15 minutes. Start time is when you made your reservation, so plan on arriving at least 15 minutes beforehand. If you walk in to rent a bike, rental times start riding. Full Day Rentals start time is our opening for that day or an otherwise requested start time, with return by close of that day or by open on the following day. Hourly Rentals: Reservations are not required for hourly rentals, but we recommend one if you are renting on a summer weekend. No deposit required, however we will only hold your bike for 15 minutes after your requested start time. Full Day & Multi Day Rentals: Reservations required, full payment via our online reservations system. No refunds for cancellations within 48 hours, a 25% fee will be applied to cancellations greater than 48 hours.